All illustrations are © Tara Books and the respective authors/illustrators. The images in this post appear with permission. 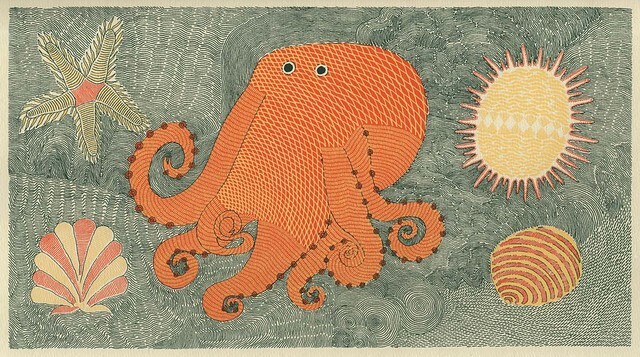 "Here is the octopus in its habitat, the ocean. I have tried to capture the ocean in lines: its restless movement, the ebb and flow of its tides, the waves that billow and fall over each other, and its sheer depth. So my lines stream in different directions, curving, circling and reaching out." 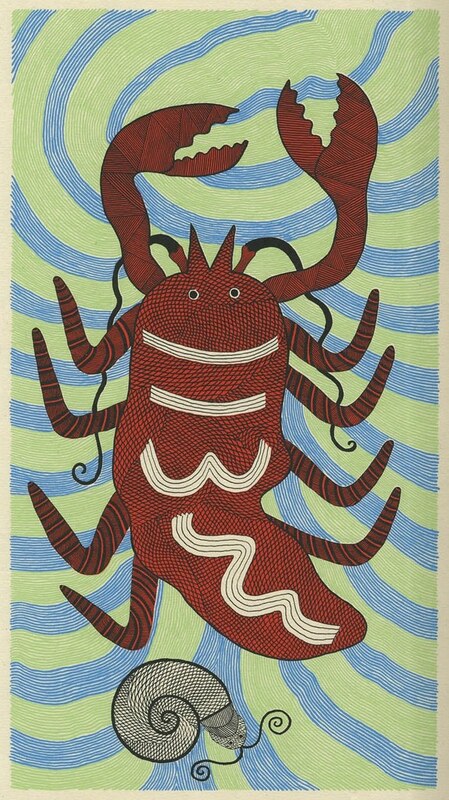 "To express its inner being, its secret core, I painted the lobster using a maze of lines, patterns and colour. When I was done, I realized that there is no limit to what art can do." 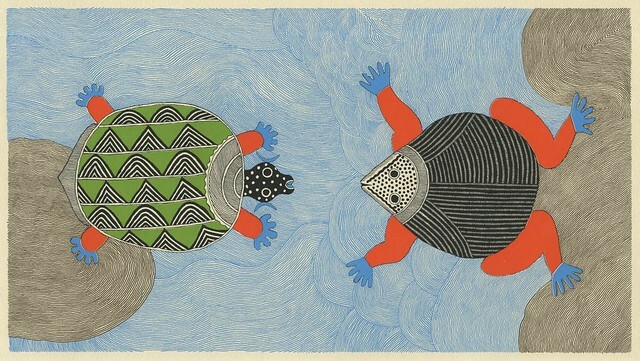 "The tortoise and the frog are favourite icons of Mithila art. I have painted them in the river habitat, which is scattered with tufts of earth. [..] My frog and tortoise are resting on these tiny islands. I think they are having a conversation." "Where I live, snakes are worshipped on a certain day in the monsoon season. This is called the Nagapanchami festival. On that day, people spread cowdung on their front-yards and draw different kinds of snakes on the surface. 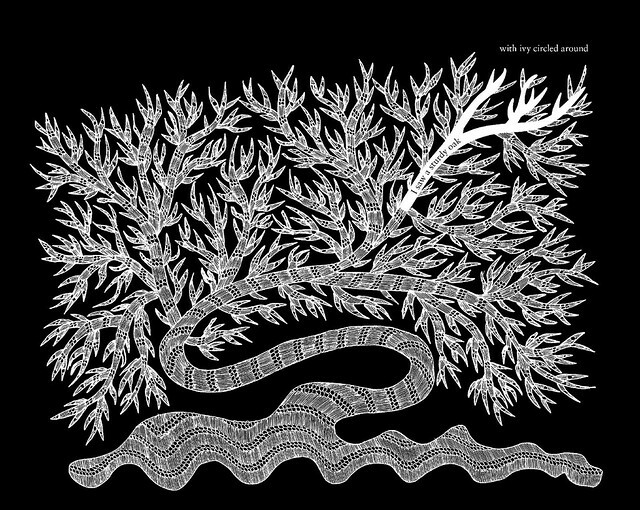 Here I have drawn my own version of a Nagapanchami snake, but I have shown it resting on the ocean-bed." "Here are some fish whose names I do not know. 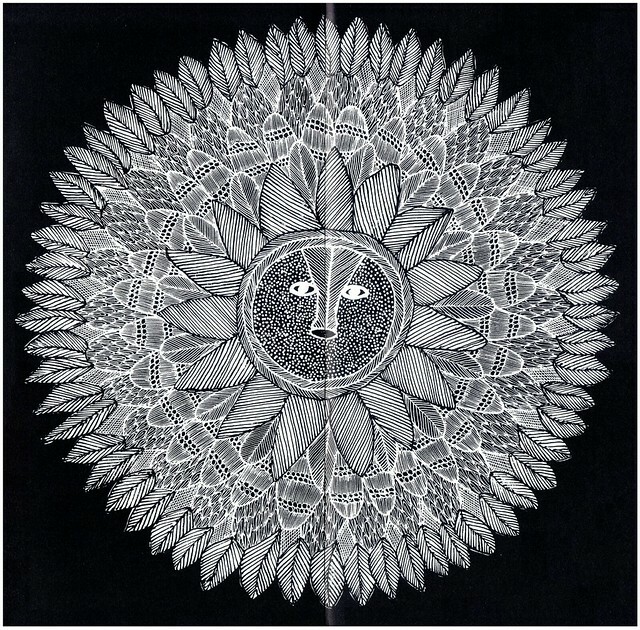 But I have drawn them according to the conventions of Mithila art. So they are familiar to me, but I have also made them new. Their otherness lies not in their shape, but in the lines of their bodies - these are not traditional Mithila lines. 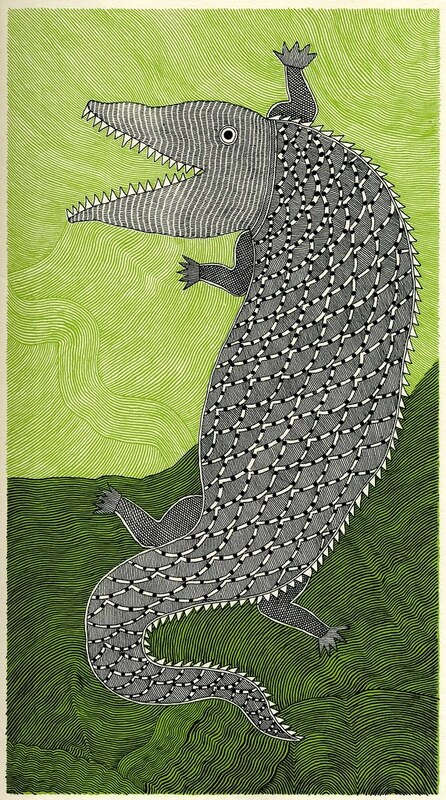 "Two things came to mind when I sat down to draw the crocodile - its prickly, harsh body and the waters that house it. [..] I have heard that a river flowing through a jungle is more green than blue, since it reflects the dense green of the foliage." 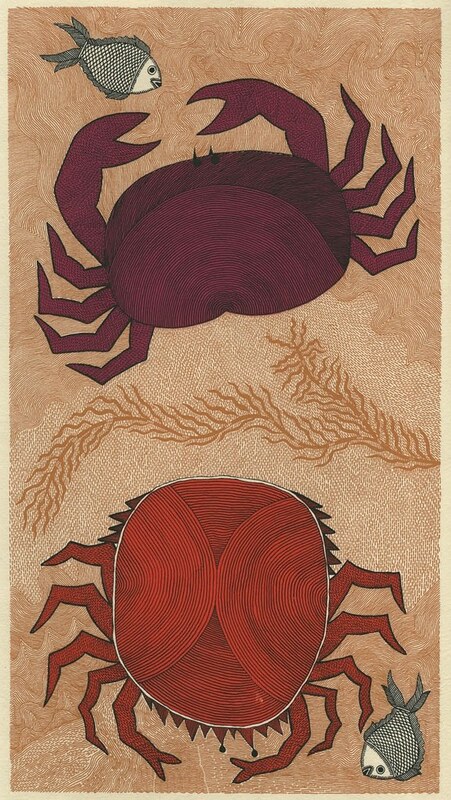 "Traditional Mithila artists paint the crab, but they also paint another related creature called the Spider Crab. I wanted to distinguish between the two crabs. I have patterned their bodies in two different ways, and let them float in their own distinctive water-spaces." At 37cm x 23cm (that's ~15 x 9 inches for the historical dystopics), the oversized 'Waterlife' (by Rambharos Jha^ to be published soon by Tara Books) is a big, brightly coloured book of hand-made paper featuring folk art from India. The gorgeous and tactile screen-printed designs are based on the wall and courtyard folk decorations that Rambharos Jha saw when he was growing up in the culture-rich region of Mithila in the East Indian state of Bihar. 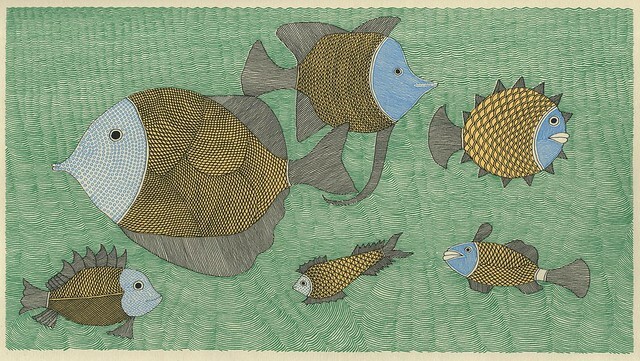 Jha also drew influence from the nearby Ganges river, developing a significant fascination for water and marine species. "The Madhubani painting or Mithila Painting [..] originated at the time of the Ramayana, when King Janak commissioned artists to do paintings at the time of marriage of his daughter, Sita, to Hindu god Lord Ram. 'Waterlife' is being released in the United States next month and is highly recommended. It is one seriously gorgeous folk art book and I am grateful - again - to the publisher for sending a preview copy. 'I Saw a Peacock with a Fiery Tail' (illustrated by Ramsingh Urveti) is another current publication from Chennai's Tara Books. It relies on the more traditional offset printing technique, but is by no means a run of the mill release. The book features strategically placed holes in pages, serrated edges, mounted diagrams and other novel design elements to add depth (and a certain whimsy) to the way the text and illustrations are perceived. 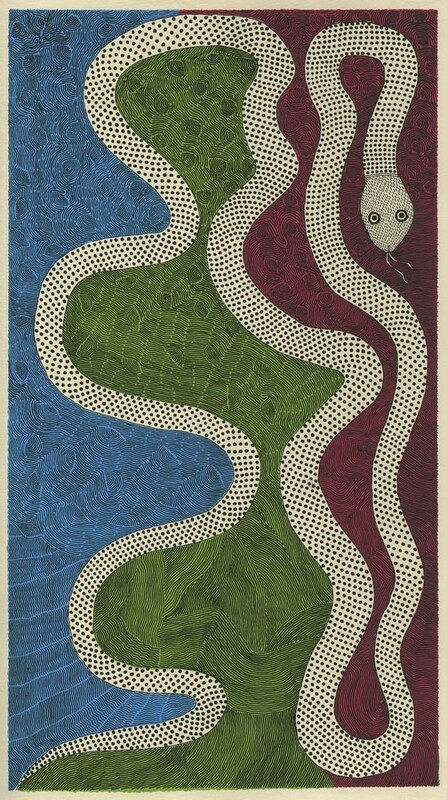 Ramasingh Urveti belongs to the traditional Gond^ tribe of artists from central India. 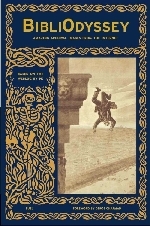 His black and white folk art designs accompany the text of the book : 17th century English trick-poetry - supposedly only - for children. The poem can be read in such a way as to either make perfect sense or be totally mad : this ambiguous nature is further highlighted by Jonathan Yamakami's innovative book design. 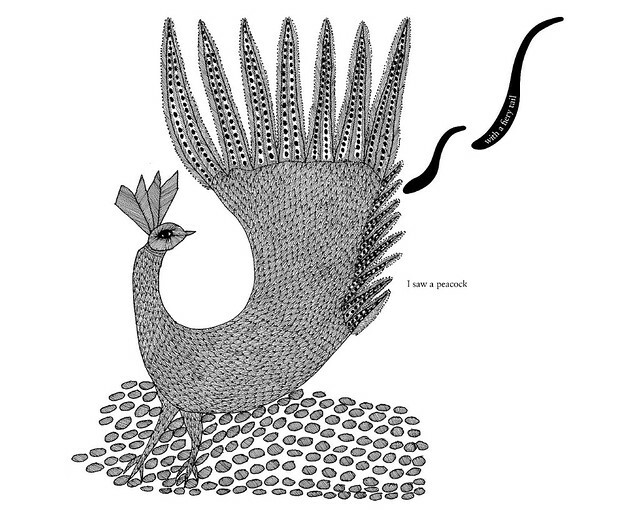 'I Saw a Peacock with a Fiery Tail' is being released in the United States in May 2012. Again, I'm fairly blown away by the quality of the book and have no hesitation in recommending it for those who like beautiful and unique publications. "Tara Books is an independent publisher of picture books for adults and children based in Chennai, South India. Founded in 1994, we remain a collective of dedicated writers, designers and artists who strive for a union of fine form with rich content. We continue to work with a growing tribe of adventurous people from around the world. Fiercely independent, we publish a select list that straddles diverse genres, offering our readers unusual and rare voices in art and literature." UPDATE:  There's a Youtube video that goes through the book, 'I Saw a Peacock with a Fiery Tail'. 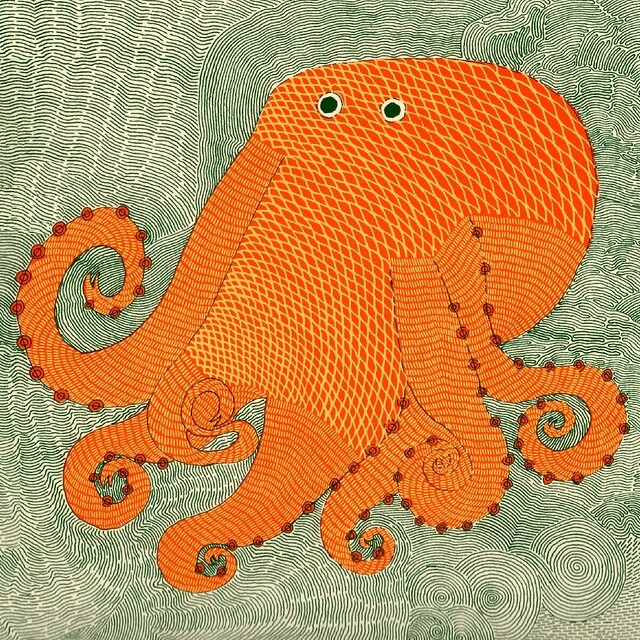 Interview with illustrator Rambharos Jha on the Tara Books blog. The Nightlife of Trees -- Folk Cats -- Gond Glyphs. This is wonderful work and I love Tara Books. 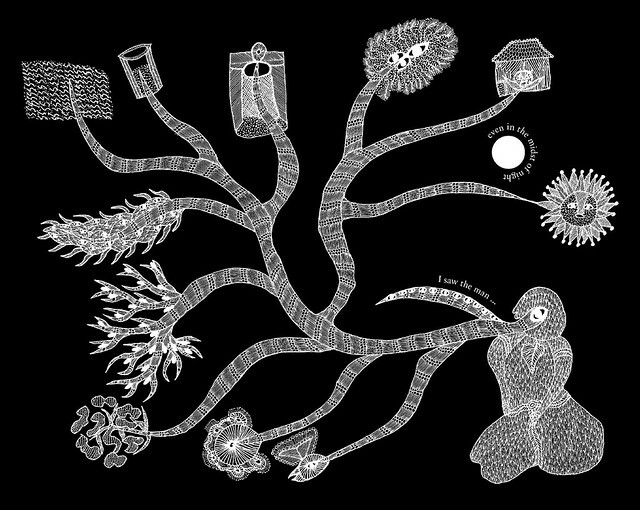 I own a copy of Night Life of Trees and love looking at the wonderful textured printing on black paper. Thanks for sharing these images. I previewed Waterlife last year at the Bologna Book Fair and fell in love with it. This year I'll try to get me a copy! Unbelievable. I must have a print for my wall. im glad you and your blog keeps getting praise for modern art. however. i can catch modern art on any number of website but pre modern not so much. so in sort. another boring modern wana-be art post. Thanks everybody &c. Or sorry for wasting anyone else's time. Jacqueline, while I wouldn't advocate breaking the book, it's probably easy to mount/frame/display the illustrations out of 'Waterlife'. The images are on every second page with the descriptions on the backs. Fantastic images with a great energy and simplicity. Look forward to getting my hands on Waterlife. Thanks for sharing such beautiful creations!! Thanks and thanks and Sophie's site is indeed wonderful. Cheers Louis. I sent the links to a friend of mine who *might* think about contacting her to do a blog post if she's up for it. beautiful! I put your blog on my link list and follow it, really interesting things you have here!